HST found two optical jets emanating from L1551 IRS5. This has been observed by SUBARU telescope, which found jet emission is dominated by [FeII] lines in the J- and H-bands. The jet extents to the south-western direction and disappears at AU from the IRS5. The width-to-length ratio is very small or less, while the bipolar molecular outflow shows a less collimated flow. As for the origin of the two jets, these two jets might be ejected from a single source. However, since there are at least two radio continuum sources in IRS5 within the mutual separation of [see Fig.1.16 (right)], these jets seem to be ejected from the two sources independently. 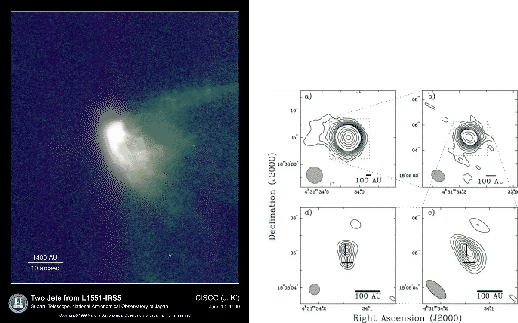 Figure 1.16: (Left:) Infrared image (J- and K-band) of the IR reflection nebula around L1551 IRS5 by SUBARU telescope. Taken from Fig.1 of Itoh et al. (2000). (A jpeg file is available from the following url: http://SubaruTelescope.org/Science/press_release/9908/L1551.jpg). (Right:) Central 100 AU region map of L1551 IRS5. This is taken by the cm radio continuum observation. Deconvolved map (lower-left) shows clearly that IRS5 consists of two sources. Taken from Looney et al. (1997). Although the lengths of these jets are restricted to 10", Herbig-Haro jets, which are much larger than the jets in L1551 IRS5, have been found. HH30 has a 500 AU-scale jet whose emission is mainly from the shock-excited emission lines. One of the largest ones is HH111, which is a member of the Orion star forming region and whose distance is as large as pc, and a jet with a length of pc is observed. Source of HH111 system is thought to consist of at least binary stars or possibly triple stars [Reipurth et al (1999)]. Star A, which coincides with a cm radio continuum source (VLA 1), shows an elongation in the VLA map whose direction is parallel to the axis of the jet. Therefore, star A is considered to be a source of the jet. Since the VLA map of star A shows another elongated structure perpendicular to the jet axis, star A may be a binary composed by two outflow sources. Figure 1.17: A mosaic image of HH 111 based on HST NICMOS images (bottom) and WFPC2 images (top). Taken from Fig.1 of Reipurth et al (1999).